Am I A Raison Head? 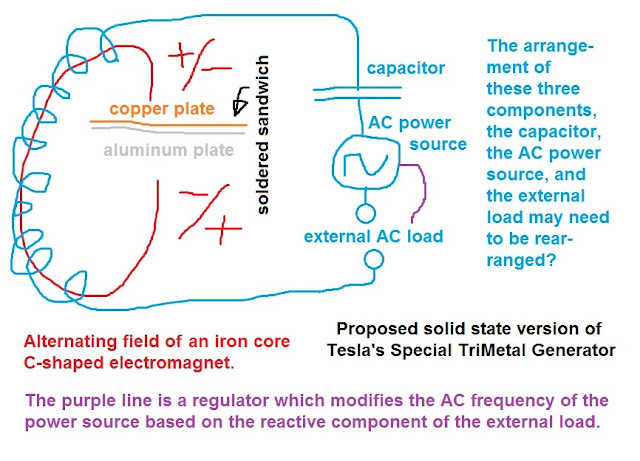 : Here is my latest imagination of a solid state version of Tesla's Special TriMetal Generator. Here is my latest imagination of a solid state version of Tesla's Special TriMetal Generator. I incorrectly quoted someone in this video. It's the north pole, not the south pole, which this fellow says has a slight tendency of sticking to an aluminum chunk of metal. My only addition to this line of imagination is to add a capacitor to make this into a tank circuit to create a reactively responsive relationship between the circuit and the external load. This is assuming that a solid-state version of Nikola Tesla's Special Generator can only be an AC device. William Lyne's story of the mechanical reciprocating piston variety lends itself to an AC version as well. So, there may not be any DC version, possible, which takes this generator out of the realm of direct correlation to any conventional homopolar or unipolar generator of Michael Faraday's legacy.